Ask Eartha: What can I do to combat climate change? Ashley Nettles, a biologist with the White River National Forest, shows 4-year-old Harper and her mom, Kristin Adkins, furs from local species that could be affected by snow pack and climate change at a previous Save Our Snow event. I have been hearing a lot about proposed federal budget cuts to climate and environmental programs, but I can’t help but notice the extreme change in weather patterns across the world. Is there a way I can learn more about climate change and how I can make a difference? Kyle, your question comes with perfect timing. 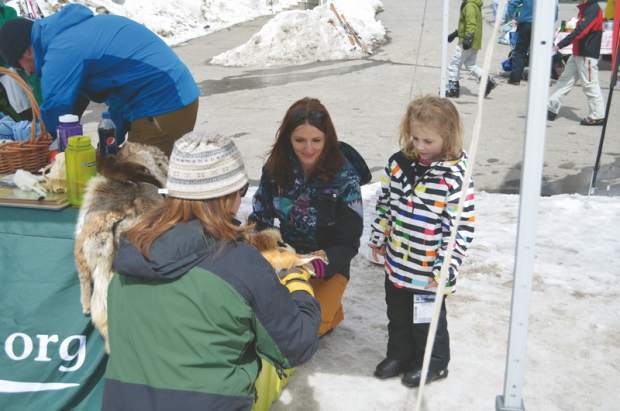 This Saturday, Arapahoe Basin Ski Area is hosting the ninth annual Save Our Snow Celebration. Many folks in our county are avid skiers, snowboarders and outdoors enthusiasts who have a real stake in what is happening with our climate. The Save Our Snow event gives folks the opportunity to meet local groups that are working to combat climate change and offers citizens ways to make an impact on the issue. Save Our Snow is an all-day event that is not only informative, but also fun. Representatives from A-Basin’s Green Team and High Country Conservation Center will be there to explain their environmental initiatives and give tips for how we can all minimize our eco-footprints. In addition, A-Basin is offering demos of awesome gear from green companies including: Never Summer, Green Sticks, Faction, Cold Smoke Split Boards, Meier Skis and more. Demos are available for $10, and there is no limit to the amount of gear you can take out during the day. There will also be a silent auction, beer, live music and amazing door prizes. All proceeds of the event benefit HC3, so just by participating you are contributing financially to an organization fighting climate change in Summit County. Following the action on the slopes and at the base area, A-Basin and HC3 have teamed up to screen the movie “Last Tracks” by Mountain Theory Films. This short film describes the impacts of climate change on skiers and ski areas and empowers viewers to take action. The movie will be shown at 3:30 p.m. in the A Frame, and afterwards, moviegoers will have the opportunity to ask questions to representatives from both HC3 and A-Basin. In addition to attending Save Our Snow, you can positively impact the environment every day of the ski season by visiting the Basin’s season pass office and becoming a member of the Snow Hugger’s Club. Membership gets you the best coupons out there: 50 percent off an adult mid-week lift ticket, 50 percent off your rentals, dining discounts and more. It costs just $20 to join, and the entire membership fee supports HC3’s programs that address issues like energy efficiency and renewables, waste reduction, water conservation and sustainable food production. And if you’re interested in creating even more change in your community, get involved with local nonprofit programs. Many organizations are working locally to reduce our impacts on the planet, including HC3, Friends of the Dillon Ranger District, Continental Divide Land Trust and Blue River Watershed Group — to name just a few. If seeing is believing, then this winter should have our community in an uproar. March is typically the month where we see the most snow in Summit County, but this year has been unusually dry. Bringing awareness to these issues is the first step to combating climate change. The next steps require concerned citizens like yourself to take action. Attending events like Save Our Snow and making connections with organizations like High Country Conservation Center will help you figure how to take those next steps. Ultimately, your actions and lifestyle choices will mean the difference between having snowy or dry winters. I hope to see you and the whole family out this Saturday for skiing, riding and saving the planet. If you would like more details about the event, visit ArapahoeBasin.com/events. Head up the pass and let’s Save Our Snow!